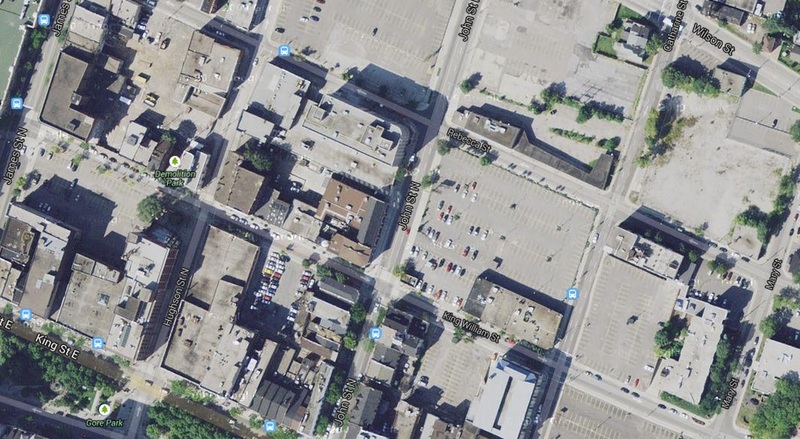 An American urbanist who has never even been to Canada has picked up on Hamilton's bizarre need-more-parking-even-though-most-of-the-downtown-is-half-empty-surface-parking-lots story. How many times have you heard a claim like "our city centre needs more parking"? I hear it again and again in cities with a conventional approach to parking policy. Take Hamilton in Ontario, Canada. Its policymakers seem keen on more downtown parking supply even when, by their own reckoning, a parking shortage is way off in the future! What's especially interesting is how, despite having never visited Hamilton, the author quickly used Google Maps and Streetview to show how ridiculous Hamilton's parking report is. He also gives a lot of suggestions, including performance-based pricing to aim for 15 percent vacancy, for how parking could be managed that should be tried before increasing supply - if parking ever really does become an issue. As it turns out, peak occupancy in downtown parking actually declined from 76 percent in 2005 to just 68 percent in 2012. It is kind of embarrassing to be taken down so easily by someone who's never even been here. Parking meter rates are $1.00 per hour. The average daily rate in Hamilton municipal car parks is $5.58 compared to the Canadian average of $13.77. There are several municipal car parks with rates as low as $0.50 per hour. There are several car parks with a Daily Rate of only $4.00. There is FREE on-street parking from November 24 to December 24. These figures are especially sad, and show that we are in fact desperately trying to attract people to park downtown with prices as low as free and $4 per day, and still failing to fill the lots to much more than 50 percent capacity. We're charging less than half the Canadian average and somehow we cannot increase the price to manage capacity? Yeah, but what does he know. That doesn't apply here, TIH.